Indra is the god of thunder and rain. Though displaced by Shiva and Vishnu among the primary gods, he still retains an important position and is often referred to as Devaraj Indra. 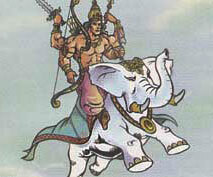 Indra is shown carrying the conch, hook, the sword, the noose, a rainbow, and the roaring thunderbolt or vajra. His vahana is the white elephant , Airawat. He lives on Mount Meru with his wife Indrani .